Samsung on Tuesday announced the NX100, a 14.6 megapixel compact interchangeable lens camera that aims to pack the power of a DSLR in the body of a compact point-and-shoot. The NX100 shares much of its technology with Samsung's slightly bulkier NX10 model, such as an APS-C size sensor, a 3-inch AMOLED screen, and 720p HD movie recording. The NX100's 100-3200 ISO will be expandable to a maximum of 6400. Unlike the NX10, a detachable flash and electronic viewfinder will be sold separately instead of packaged with the camera. One of the NX100's highly touted features is its special i-Function lens, which will let users select and adjust exposure parameters by using a single button and focus ring on the lens. Typically, photographers wrap their hands around the lens when holding the camera. The i-Function lens will let users quickly change settings like shutter speed, aperture, EV, WB, and ISO, without needing to take the camera off target. The NX100 also features a lens priority mode, which makes switching lenses easier for less experienced photographers. Each lens is marked with icons that illustrate their main usages, and the camera will provide scene options specifically designed for the lens being used—when a landscape lens is attached, for example, the camera will immediately switch to landscape mode. The camera will also be able to recognize Samsung's upcoming specialized lenses, and will automatically configure the settings that would best match with them. At launch, a compact zoom 20-50mm lens will be available, and a 20mm wide angle Pancake lens will be introduced shortly after. Two additional specialized lenses will be available in the first half of 2011: a 60mm Macro lens and 18-200mm Super Zoom lens. Further accessories, including an electronic viewfinder, flash, and GPS tracker, are also planned. 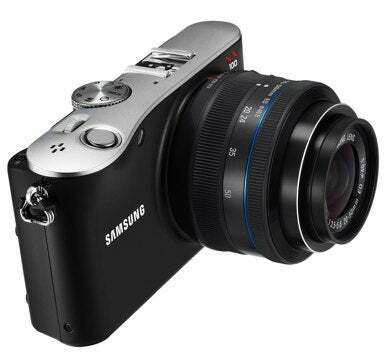 The NX100 will be available in brown and black in the US. It will be sold packaged with the 20-50mm lens for $600 and begin shipping in October.